A dynamic personality is gaining popularity amongst many Facebook users around the globe, especially those who live and thrive with some of life�s more difficult challenges. Philanthropist and artist, Kennedy Ng�ang�a, inspires thousands of people with his engaging personality and caring heart. He paints in bold strokes using his clenched hand to hold the brush. His colorful imagination pours into his art as if his paralyzed body dances and sings. The story of the Mama Kennedy Fund is featured on Kennedy�s website (http://www.kennedynganga.jigsy.com/). �In August 2011, with around 175.00 US dollars I started a fund�at our local church Mtopanga Revival Baptist Church, where she has been the elder, and also the eldest member in her honor, and also to keep her legacy of devotion to the welfare of others, alive.� Most of the proceeds from the sale of Kennedy�s art are given to support the fund. Kennedy tells me of his desire to help the �disability group called Mbazizo Disability Self Help Group from the poorest area in Kenya�� This group heard about Kennedy�s philanthropy and honored him by inviting him to be its patron. On Mother�s Day, the Mama Kennedy Fund gave supplies, gifts and other much-needed items to the group... Ken writes on Facebook, �The group is from a poor, forgotten arid area where poverty ruthlessly rules.� He posts pictures of the event showing smiling faces amidst a Christmas-like atmosphere. No one would guess that the colorfully dressed people feel anything but hope. For the past year, Kennedy�s Facebook presence has grown strong, and friends are added every day. Another of Kennedy�s friends, Freya Pruitt, also from San Antonio, wrote an article in her �Transforming Today�s World� magazine featuring Kennedy�s art and courage. On Friday, May 18th, she held an auction to sell many of Kennedy�s original paintings, in order to help Kennedy and the Mama Kennedy Fund. When people see Kennedy�s artwork, it is almost inevitable that they are drawn to his spirit. The art is colorful and alive. 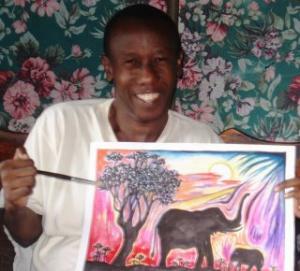 He paints images of Kenyan life, natural beauty and amazing animals. His subjects move across his canvasses, vibrant and alive, drawing us into his world of dreams and hopes and his visions of how life in Kenya might one day look for himself and others who are poor and disabled. Kennedy shares something with others who face daunting challenges in that living with a disability often brings out amazing gifts of compassion and self-expression. Of late, Kennedy sometimes woke to find his legs and feet bleeding from the bites of rats who invade his home. The distress I felt from this disturbing news, however, was soon assuaged by an email from Kennedy with the subject line, �A Stranger in My Castle.� He wrote, �This strange intruder which looks more a cat than a giant rat came to our shant[y] 3 days ago and has kind of driven away the rats and taken over the territory. It only appears at night and has not harmed anyone apart from digging holes on our earthen floor and stealing my mangoes and bananas. It also seems like a snake eater which is an advantage too.� He attaches pictures of the large rodent-like creature. I immediately look on the internet and find that his guest is a genet. I write back and tell him what the animal is and that they are a lot like cats or ferrets. Some people keep them as pets. Many people�s prayers are answered by the genet, especially Kennedy�s. By the end of the interview, I feel closer to Kennedy than many people I have known for years. He is my �dear brother� and greats me always with �my dear elder sis.� I am touched by him each day I know him, and I am inspired by him as I find my own other-abilities. If you love art and have a wish to give, check out Kennedy�s webpage and support his dream if you can. Kennedy reminds me that he also does custom paintings of any subject someone wants and will mail it anywhere in the world. and help you find release, relief, and hope. Art is neither good nor bad, something to be scrutinized exploited, contained or blamed. We are creators of our own truths. We do not lie in fields of heather to pretend we are done. one violet piece of heather, one amongst millions. to become something better than living. on the canvas and on the heart. � all things within and out. Art is not lonely, but connects us to others in a spiritual realm. We find passion experienced in no other way.